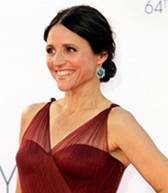 Celebrity stylist Daniel Howell created Julia Louis-Dreyfus' award-winning look at the glitzy Emmy Awards, which were held in Los Angeles on September 23. Howell exclusively used Alterna's Caviar Anti-Aging product to create Dreyfus' casual yet sophisticated low knot. "I loved that Julia's modern dress had subtle vintage details, and I wanted to translate that into her hairstyle with an organic and textured chignon at the nape of the neck," says Daniel Howell. Begin by washing the hair with Alterna Caviar Anti-Aging Moisture Shampoo & Conditioner. It's important to use products specifically designed for colored-treated hair, so you can lock in moisture. Towel dry hair and spray generously with new Alterna Caviar Anti-Aging Styling Prep; comb product through using a wide-tooth comb. Rough dry with fingertips and a diffuser attachment in an upward motion to create lots of volume from the scalp. Begin at the nape and divide the hair into 2" sections. Spray with Alterna Caviar Anti-Aging Perfect Iron Spray. This will lock in moisture, but block out humidity-the enemy of keeping a style intact. Using a 3/4" curling iron, wrap sections around the iron keeping it an inch from the scalp. Hold for 30 seconds. Continue until all of the hair is curled. Smooth a dime-sized amount of Alterna Caviar Anti-Aging Ultra Sleek Polishing Serum through the ends of the hair to eliminate flyaways. Create a deep center-part, and pull hair into a low, loose ponytail. Twist and wrap pony into a loose knot and secure with small bobby pins. 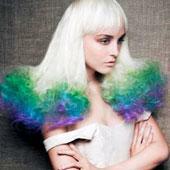 To ensure the style holds, mist with Alterna Caviar Extra Hold Hair Spray in long feathery strokes.